Today is Helene Phillips’ birthday. 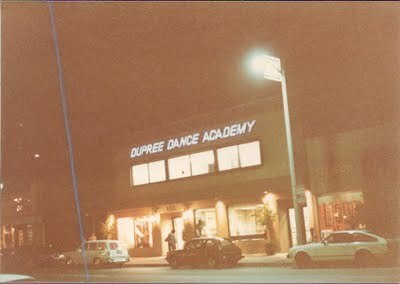 Helene and I were on scholarship at Dupree Dance Academy on 3rd Street when the studio was the center of professional dance in Los Angeles. We got on scholarship sometime around 1977 with a few other dancers, The schedule was grueling I think we were required to take at least 4 or 5 classes a day, as well as assist any teacher who asked. We spent all day there. I remember that after about a month of this, all of the other scholarship students had stopped coming to class because they were so exhausted. Helene and I were the only ones hanging in there. I can remember one afternoon when we were sprawled out on the floor of the lobby, totally sore and sweaty, consoling each other, our muscles like jelly, but determined to not give up. Roland Dupree eventually lowered the number of required classes and all of the scholarship students returned. But since that day, I’ve always had nothing but love and admiration for Helene. We were the two who didn’t give up. Previous Post: American Academy of Dramatic Arts Second Year begins. Copyright © 2019 Mark Knowles. All rights reserved.